So is this my contemporary sensibilities, my modern moral compass set in a fantastically different, less physically grueling and brutal world that recoils from Nephi’s terrifying justification? Undoubtedly—although that in itself certainly makes it no less right. But the text itself and Nephi’s manner of disclosing and addressing this event offers evidence that something was rotten in Nephi’s Denmark. I think Nephi dwells on the murder at length because it was a significant issue well down the road (as murders often are). This is one of the reasons for writing 1 Nephi in the first place. The murder is such a conspicuous event, that I suspect it was central to the anti-Nephi campaign that I can’t help but see wound completely through the story. At some point it became known, and whether then or years later in the Americas, it became an issue. Perhaps the youthful and indiscreet Nephi bragged about it: “When Laman went for the plates, Laban nearly killed him. But when I went for the plates, God delivered Laban into my hands and I smote him!” Perhaps the blood and gore were conspicuous once the sun rose (I’ll confess—I always wonder morbidly about the clothes; decapitating someone is messy business; how could he then dress in Laban’s clothing? and what did he then do with the body? the messiness calls out for explanation). Perhaps he was haunted and later confessed. Perhaps the news of it was everywhere when they went back for Ishmael’s family, making it impossible for Nephi to hide the fact. Maybe Nephi was simply candid in telling his brothers and parents what happened, and this candor was later used against him. I also wonder at Nephi’s own dialogic narrative. Again, if we take the record at face value, then this is a decades later recreation of whatever went through Nephi’s head at the time of the event. There are certain cherished, life changing conversations I’ve had, and relaying them now I think I get main points right, but certainly not the specifics. What tends to happen is that the narrative changes and gets codified in order to emphasize whatever it is that’s important to me. This is natural—and unavoidable. So it’s important to remember that we’re not getting an actual transcript of Nephi’s dialogue with the Spirit. Additionally, even assuming a radically different and more violent culture, this was an event that would’ve filled Nephi’s blood with enough cortisol to cast doubt on not only an accurate recreation of his conversation with the Spirit, but probably the full details of the event itself—even if he’d written it the next day. This is a narrative that Nephi’s worked at and polished. He explicitly draws upon Deuteronomy for his justification—which he likely would not have even known prior to getting and studying the plates (and there’s no telling how much time passed before he had access to the record he stole). This passage emphasizes Nephi’s own “shrinking” from the act before offering a simplistic and barbaric set of excuses for the murder—blaming God in the same way certain folks love to blame the devil. At any rate, my cynicism isn’t necessary to my point: Nephi gives us a much later and carefully crafted narrative that emphasizes why his act was ok. This is fact that all of us have to wrestle with, whatever we think of the event itself. Nephi’s emphasis in the story only makes sense in response to the obvious point that his act was certainly not. I almost hate to mention it, but at this point I can’t help but reread Nephi’s earlier faithful, scriptural contextualizing (e.g., vs. 1-3). Rather than an inspiring model it now shows up as intentional rationalizing, priming, and manipulation. Nephi, you were indeed like your hero Moses: an outright murderer, called by God to stand as a prophet. But I far prefer Moses’s unvarnished, unjustified narrative to your careful politicking. Perhaps Nephi was justified by the Law when he took Laban’s life but didn’t want to do the dirty work at hand. After all, he says the reason he recoiled at the idea was that he had never killed anyone before. But we moderns tend to read into the narrative that he must have had difficulty with it because of moral reasons. Loosen up on the presentism, bro. Ben S: Thank you for the reference — I hadn’t seen that. I only scanned through it quickly, but it’s really interesting. I particularly think the comparison of Laman/Lemuel to Saul apt — I think that parallel helps to bring the whole text in greater focus. Jack: I’m not sure how to take the presentism comment. That is, I’m not sure if it’s the fact that I’m offering my own personal thoughts on the scriptures and how they relate to my life that you don’t like or that I apply a “contemporary” moral lens to the situation (or something else?). If the former — well, sorry, that’s what the project — like all scriptural reading — is. If the latter, I address it directly in the post. You’re right that Nephi’s stated reason for recoiling is not the thought of murder but merely his having not done such a deed before. This is one of those particularly challenging aspects of the whole passage. Terry, this is actually one of the types of justification I’m alluding to throughout. I remember being jazzed about Welch’s article when I first read it (on my mission I believe), but it’s rather lost its luster since (although I confess, I didn’t re-read the whole thing just now). I think that Welch does a great job recreating how this might have gone in the ancient world — and even more relevantly, helps us to understand what Nephi intends to do with his narrative, justifying his actions to others. But alas, murders of passion are still murders, even when the murderer is convinced (even in the moment, to say nothing of when its a retroactive recreation) that God wills it. Why are you trying to fictionslize the story. An angel comes to all of them and commands them to go back and the Lord will deliver Laban into their hands. Nephi obeys and lo and behold the Lord has delivered Laban into Nephis lap. The command to kill Laban comes from the Lord. Nephi hesitates but then is commanded again to take Labans life. Nephi does as the Lord commands, gets the plates and flees. Not really sure why you have an axe to grind with Nephi but its getting old. Rob, we are going to have this kind of discussion in this blog series. We aren’t trying to fictionalize Nephi. We’re trying to take him out of fairy-tale land, trying to see Nephi as he really was. Remember, Mormon explicitly acknowledges that there may be faults, and every single human in the narrative was fallen. Trying to fictionalize that by making Nephi a fault-free Prince Charming is getting old. He acknowledges that his soul grieves because of his iniquity. I hope you will too. At the very least I can’t imagine him nonchalantly shrugging off that he chopped a man’s head off, even if he knew it was justified. Here’s a thought I have on justifying the death of Laban. Nephi knows what happens to murderers. He even knows what happens to men of war, who kill because God commands them to. If you shed man’s blood your blood must be shed by man. Maybe the one who it is better to perish is Nephi himself. I’m not saying Nephi was guilty, and in fact he is referred to as a temple builder later on. I’m saying Nephi was willing to give himself up, make himself into a murderer or even just a man of bloody hands, so that his people would not dwindle in unbelief. A sign of the wickedness of rising generations is that they “became for themselves,” or became unwilling to sacrifice themselves, body or soul, for the continuation of their people. Mormon’s soldiers were fighting because they wanted to win, then fighting because there was nowhere to run. And so they dwindled and perished. There’s more to the collective righteousness of the Nephites than just the heroes. Rob, while I tend to favor the more straightforward reading, the types of questions a close reading bring are important. Effectively you are just saying that we should read the text as if it was written by someone with no biases, mistakes or aims. That just seems wrong. Even if you favor a straightforward reading the close reading by paying attention to the words and sentences in the text is quite significant. That said, I do think there’s an important question to raise about how we judge among competing readings and where the burden of proof is. I think for instance that readings that go against the more straightforward reading do require justification. I cant really see any other way to read the text other than to just read it exactly as simply as it is stated. If there are faults, and it didnt realky happen the way its read, well, thats not my fault. But, it is my fault if I start reading scenerios into the text between the lines that just do not exist. What does the text actually say about Nephi? I dont think James is correctly identifying who Nephi really is, strictly off of the actual words found in the Book of Mormon. Rob, then you’re not going to enjoy this reading since it’s asking these sorts of questions even if we can’t fully answer them. Not really what to take from it other than a work to marginalize Nephi and thus undermine the credibility of the Book of Mormon. But why do that unless you are anti-Mormon? I think you’re just misreading the project Rob. It’s to read closely and engage with the questions in a faithful fashion. This project has had Nephi front and center. He is not marginalized. Even if he were, that would have nothing to do with Moroni’s promise. There, we’re not marginalizing Nephi and we’re not undermining the Book of Mormon’s credibility. In fact, we’re building up the Book of Mormon’s credibility. If we wanted to undermine it, we might cling to the words’ face value like we were fundamentalists, ignore any attempt to treat the characters as real people, and transform 1 Nephi into Beowulf. Make it a fairy tale. Act like we’re sociologists. But we’re not making it a fairy tale, we’re speculating as to what kind of real history it is. I seek the Spirit as I do so, hoping that some of the things in between the lines will be revealed to me, because I know God is liberal to him that asketh. I hope you will seek a deeper understanding of the Book of Mormon as well. committed with malice aforethought and a death that was purely accidental. I think its important to note that Nephi makes it a point to establish the mechanism of faith. Its true that Nephi does take Labans life. But he only does so at the prompting and command by the spirit. The events transpire in such a quick manner that Nephi is going from one event to the next that night in a fluid like manner. That is how the spirit works with our faith. 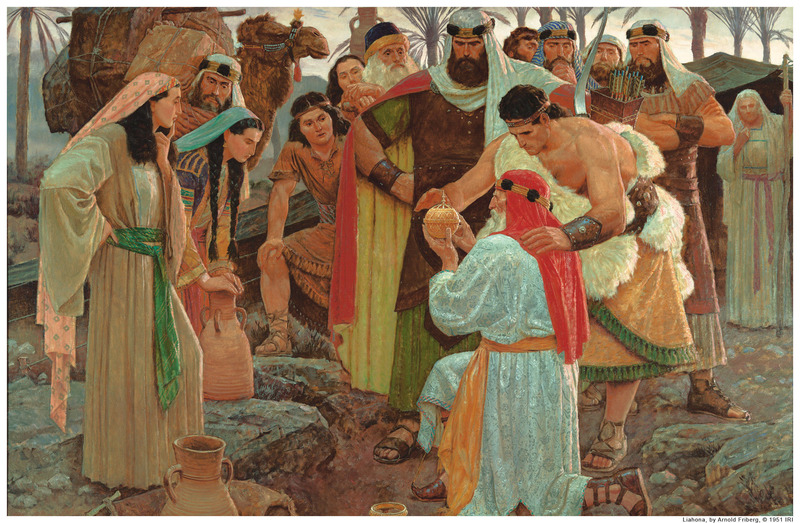 Nephi knows his family has a bounty on their heads to be killed. He knows that he must aquire the plates and was willing and ready to bring the fight to Labans household “alone”. Probably the last thing on his mind upon first entering the city that night is it is him who will be the instrument in Gods hand to destroy Laban. You see, I dont think Nephi needs to justify his killing and thus the reason he adds it in the story. I think Nephi includes it in the story to show how the spirit works with our faith. Above all though, we must revere Nephi as an obedient, brave, and special servant of the Lord. It is just one of the many telling events that unfolds that places Nephi at the helm of their survival and miracles. As you note even ignoring those issues Laban still seems pretty ambiguous. Of course the Old Testament (pre-Davidic Kingdon) seems much less interested in these questions – especially in Genesis. Even if the legal tradition probably develops by considering these narratives. Getting back to the ethics, I think the question James is really asking is what we’d do in similar circumstances. Like almost everyone just feeling a prompting or even an “inner voice” would probably be insufficient for me personally to think I’m sure God is directing things. If God is directing things then the debate is over from my view. Yet the tricky part is being sure you’re getting a revelation and then interpreting it correctly. Interesting to the narrative those sorts of questions aren’t addressed. We don’t know whether Nephi is hearing a voice, if there’s an angel, or what’s going on. Yet to our modern mind those questions seem key to understanding the situation. That said, I also think that even for most modern Americans with our rule of law and liberal democracy the actions of Laban were such we’d probably kill Laban independent of God commanding it. The interesting thing is that Nephi doesn’t want to do it. God has to command him to do it. Culturally that just seems quite interesting to me. I know culturally today the concern for many is Nephi deciding to do it. Yet I think the much bigger question isn’t why Nephi would do it but why he wouldn’t do it. Something that’s not been really addressed well yet. Clark. Here’s where I think some struggle (including Rob Osborn), trying to figure out Nephi’s “ethical questions” if any. Frankly, the legal question has to be the basis of beginning. I’d forgotten the Jackson conversation with Welch (good job David Day). When we begin trying to analyze Nephi’s actions, we have to start with the what was legal and illegal. Of course, that requires knowing what the nation-state-town-culture says about that. If it was legal and permitted, perhaps Nephi didn’t wrestle with it as perhaps our modern day 21st century minds might. I think that James is a bit too “sensitive” about what Nephi should have felt or even may have felt. I think its a proper subject for discussion and I DON’T think it isn’t faith promoting, but I do think it perhaps misses the mark. I think that more in today’s culture would shrink from killing Laban in his drunken, unconscious state than we realize. Its not really a “stand your ground, self-defense situation”. I do think that your question is the correct one though, we ought to be focusing on why Nephi wasn’t anxious to do it. Nibley went through that with his Arab Book of Mormon class decades ago (so the story goes). For them, it was a no-brainer. As for the Exodus position, I think Welch and Jackson are both fully aware of and sensitive to the provenance of that, but I’ve recently been going through a lot of Exodus material for a project, so I’ll look more into it. Hopefully, I’ll find something I can add to the discussion. Terry you’re right to call me out on that point about whether contemporary people would have killed Laban. I should have distinguished between those who think it was just and would do it and those who think it was just but just would have trouble doing it. Much like I’ve heard it’s common for soldiers in their first battle to not actually fire their guns. Terry: As is already clear, I disagree. If we want to put Nephi on trial—or perhaps simply to assign culpability—then the legal questions and culture are the place to start. If what we care about is either a fuller moral analysis or reading the scriptures for ourselves as scripture, then the legal question is heuristic but certainly not primary. It’s a common mistake to conflate blame with obligation or right/wrong, just as it’s common to dismiss the faults of our heroes so as not to implicate ourselves. Even going the other (in my opinion backwards or at least less valuable) direction, however, we have to admit that what we have here is only the defense’s (we might say “perpetrator’s”) version of the story. Which Nephi’s own account manifests it as controversial in his day. Which is certainly not enough to exonerate Nephi. It’s like condemning the Sanhedrin based solely on Matthew, Mark, Luke and John (incidentally, something else we’re usually quite—illegitimately—comfortable doing). To say it’s not a “self defense” situation is quite the understatement. I certainly hope that “many” today would shrink from the task! That is, I certainly hope that Clark’s wrong—even in the clarification that pulls apart thinking it just from being willing. These conversations get a bit surreal sometimes. Of course again this is a place we don’t have sufficient information. So we’re just speculating on various ways to read the text. Regarding the bigger picture about ethics it’s an interesting question. I’m not sure how far down you want to go on that tangent. I’m actually pretty sympathetic to the comments others have made that Laban is a bad guy and deserves to be removed. Even had Nephi not done the job in just a few years the Babylonians would have. Laban had been pretty emphatically warned by the prophets. We know that soon (if it hasn’t already happened – the dates are a bit ambiguous) Jeremiah is arrested and nearly killed. This is why Robert’s raising the whole dirty hands issue seems genius to me. Even if we address the ethics questions I think we at minimum have to remember that this is not a case of the ethics of regular life. This is much more akin to the ethics people in war zones have to deal with. If we apply the reasoning of the ethics of regular life, I fear we go astray. Now I recognize that for many there is no divide between the ethics in regular mundane life and extraordinary circumstances. I tend to think there is although I recognize things get murky quickly.